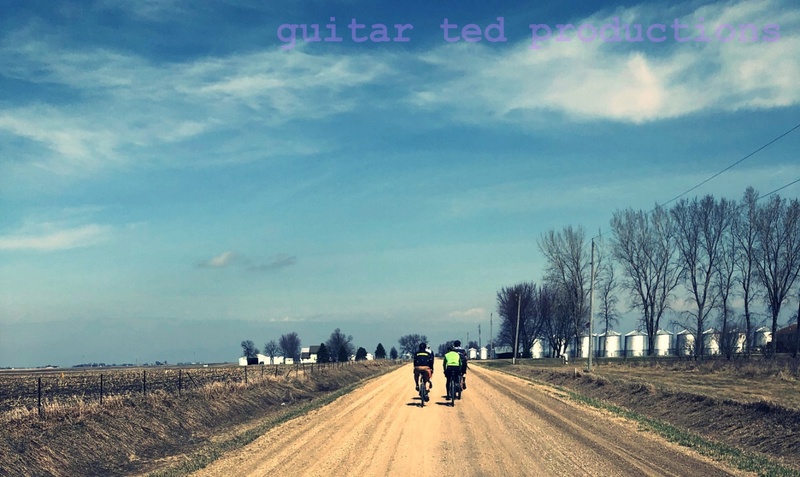 Guitar Ted Productions: The Touring Series: Getting Juiced! We scrambled across a busy roadway to a group of small wood framed buildings that made up the bulk of the town. The city was called Babcock, and it had one main attraction, the Cranberry Inn. It was a white clapboard building with no real distinction other than the bar sign that hung off the upper story. Three or four steps led up to a door that led unmistakeably into a bar. A bar that was a happening place this late Tuesday afternoon. Troy was beside himself. He was not wanting to waste any time going in to a bar. However; Steve insisted that more "information gathering" was necessary and this may be our only good opportunity. Based upon what I saw of the previous miles since Millston, I had to agree. Entrance to Babcock, WI from a recent image on the web. So first Troy and Steve entered the bar while I stood guard over the bikes. They were in there for what seemed like an eternity when Troy finally popped out and motioned for me to go in and " get Steve out of there!" Apparently Steve had availed himself of the offerings inside, much to the consternation of Troy. This would become a sticking point later on, as we shall see. Inside was your typical bar scene- well, rural bar scene! Guys would "belly up" to the bar, order beers, and "BS" their way through conversations about various subjects. Smoke filled the air and loud, boisterous men sodden with "barley pops" were the over riding sensory inputs. I found Steve at the far end of the bar with an empty stool beside him. I plopped myself down and made some small talk with a few locals, sipped my Coke, and convinced Steve it was time to go. My main memory of the place was of a t-shirt that they sold emblazoned with the words- "I got juiced at The Cranberry Inn" Too funny and all too true for the majority of the patrons there that day. By the time I got Steve extracted from the grips of The Cranberry Inn, Troy was fit to be tied. Wanting to get in some more miles before sunset, he set an infernal pace on the busy, wood chip laden highway that was none too smooth. It was getting on to be evening and we had about twelve miles to go to get to the next town of any decent size. As we approached the end of the day, we saw a big, tall smokestack emblazoned with a "GP" on it. Georgia Pacific, a paper company, had a huge mill here. The city was called Nekoosa and it looked mean and dirty. It was late enough that the light was fading fast. We were discussing possible overnight stay choices when we saw a sign for a campground. Too bad it was another seven miles down the road! We just didn't have enough light to make it that far. Just when I thought all hope was lost, Steve spied a church with cars parked in the lot. Ever the optimist, Steve said he would go in and ask to see if we could camp there. He came back out shortly after, proclaiming his good luck. Apparently the pastor and the church board were having a meeting, and we were allowed access to the "back yard" of the church to pitch our tents on. It turned out to be a beautiful strip of lawn bordered on one side by the church and on the other by the wide Wisconsin River. It was looking like a rain was going to set in as we started to download our gear for the night. Steve was busy setting up his tent, but Troy was looking around the church. It had about a ten foot overhang to the roof and about a seven foot wide cement pathway around its base. "Why not sleep here"?, Troy wondered, and I agreed that it looked good, and too easy! We chuckled at Steve as he set about getting his stuff into his tent. After riding so hard till we got to Babcock, it seemed nice to me to sit in a bar for a bit, but in reality this stop burned up a LOT of time which we nearly paid dearly for in terms of setting up our overnight camp spot. The ride from the Cranberry Inn to Nekoosa was hard, fast, and fraught with busy two lane traffic in ever worsening light. I remember being pretty fearful of setting up tents in a total blackout condition in some wooded area up the road. The chance meeting of that church board that night was a big blessing!